OdiTek Solutions offers QA consulting and software testing services tailored to help the BFSI industry overcome challenges and constraints they face in adopting the latest technologies and dealing with legacy applications. With experts specialized in wealth management application testing design, development, and implementation, our BFSI testing team assists clients in streamlining their internal processes leading to enhanced productivity and improved customer services. Our proficiency in tools, expertise in latest technologies, awareness of BFSI dynamics, and rich repository of re-usable test cases assure clients of low-cost banking application testing services, robust QA consulting, effective resource optimization, and on-time delivery. 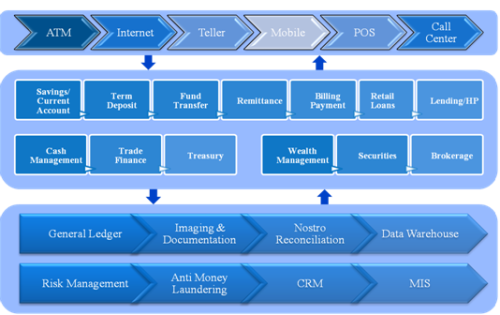 We provide full spectrum of finance application testing services for banks and financial institutions to leverage up-and-coming market opportunities. Our cost-effective and value-added wealth management application testing services have helped many in the BFSI industry to effect business expansion and improved service delivery. Requirements which are to be met by the particular application are gathered and documented in this stage. This is done by a Business Analyst. The requirement gathering document is reviewed at this stage. Quality Analysts, Development Leads and Business Analysts are involved, in which they cross check that it does not affect the workflow. Business requirements Documents are documents prepared by Quality Analysts, in which all business requirements are covered. Further it is reviewed by Business Analysts. Test Cases are executed either manually or using automated testing tools. In database testing, a tester checks whether the data entered in the frontend is correctly displayed in the backend. Database testing is an important part of the testing phase, in banking applications. Security Testing makes sure that the software does not have any security vulnerabilities. This is the final stage of testing before the rolling out of the application. This testing is usually done by the end users to ensure the compliance of the application with the real world scenario. After successfully tested by the users, the application will be accepted by them. BFSI organizations can rely on OdiTek as their software testing solution provider. Our expertise lies in building agile, reliable and robust test solutions that help clients address their need for a flexible and cost effective solutions. Our specialist testing teams have extensive experience in accelerating testing through customized Test Automation solutions. Our cost-effective solutions help BFSI organizations optimize resources, enhance operational efficiency, mitigate risks and reduce time to market, allowing them to concentrate on core competencies and effect business expansion and improved service delivery. If you are looking to hire BFSI testing experts for your project or want to avail best BFSI testing service, get in touch with OdiTek today. We have BFSI domain specialists who can understand your needs and provide affordable solutions.